Back cover blurb: Everyone has an idea of what their perfect life is. For Agatha, it's Meghan Shaughnessy's. These two women from vastly different backgrounds have one thing in common - a dangerous secret that could destroy everything they hold dear. Both will risk everything to hide the truth, but their worlds are about to collide in a shocking act that cannot be undone. The compelling new psychological thriller that will break your heart into tiny pieces. When Aggie turns up at Meg’s antenatal yoga class, Meg is delighted to make a new friend. Someone who is likeable and funny and carefree. Someone very unlike the stuck up yummy mummy’s that she usually hangs around with. When Meg has her baby son Ben, Aggie is thrilled for her friend. After all her own son Rory was born only days before. But then Ben goes missing from the hospital a d Meg is forced to question every single person in her life, new or old. She knows that whoever took Ben probably won’t harm him as they would have been so desperate for a child of their own, but when any woman is faced with a truly desperate choice who is to say how they will react. Is Ben in danger, or in a pair of very safe hands no matter how strange that might seem? The secrets she keeps is a very clever novel, and it will keep you guessing. Another cracker of a novel from Michael Robotham. 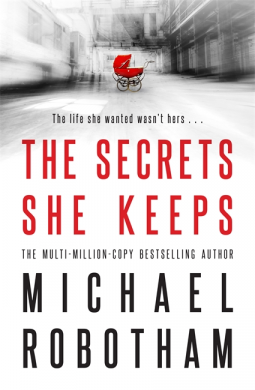 The secrets she keeps is available now via Amazon online and all good book shops.